Do you enjoy swimming, diving and splashing in the water? Giant Otters do to! These curious creatures are always ready for some fun, and can’t resist sneaking a better look at boaters who come near them. Known for their fun loving nature, the Giant Otter isn’t likely to be a hermit. In fact, he’ll usually live in a group with ten or more of his fellow otters. 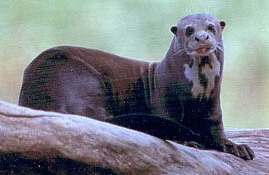 Giant Otters spend many hours each day in the slow-moving rivers of the rainforests or wetlands. Only between 2000 and 5000 of these endangered species have survived the hunt for their luxurious fur and the shrinking of their habitat. You can find those fortunate survivors mostly hidden in Brazil’s remote tropical waters, but once they thrived extensively throughout the tropical rainforests of the great Amazon and in the world’s largest wetland, Pantanal (located in Brazil). Giant Otters are… you guessed it… bigger than otters found in other parts of the world. These creatures can grow as long as a tall man. At six feet long, they only weigh 70 pounds, which gives them a streamlined sleek look. Especially when their shiny wet fur glistens in the sunlight. Their wee slitted nostrils and tiny ears keep out water as they dive and play in the river. Their webbed feet and stout, partially flattened tails make them great acrobats – gliding and diving through the water with amazing grace and speed. Slow moving fish and crabs beware! The Giant Otter will eat more than ten pounds of food each day. Even though they are great swimmers and divers, they lazily hunt for slow moving food. Underwater, a giant otter will give chase to its prey before snapping it up in its quick jaws. He’ll then find a nice “picnic spot” to have his lunch. Saving food is not an otter specialty. Did you know that Giant Otters have pups? No they are not pets with collars and fleas. Baby otters are called pups. Every group of otters has a male and female who has baby pups – anywhere from two to five each year. Most of the time the mama otter only has two pups to care for after a sixty-five to seventy day pregnancy. The giant otter’s cousins are both the river and sea otters of North America, Europe and Africa. Their only enemies are humans who once hunted them for their valuable fur and gold miners who unknowingly poisoned their water with mercury they used to separate their ore from the mud. E-mail to add your Giant Otter related website.